This topic describes how to provision users from OneLogin to DocuSign. Important! DocuSign's API limits provisioning events to user creation and deletion. It does not allow updates to existing DocuSign users. OneLogin does not attempt to provision user updates to DocuSign, but nonetheless the Users > Provisioning page will show a successful provisioning event. Ignore this! Any attribute change that you make in your user directory must be replicated manually in DocuSign. For example, if a user gets married and changes her name, you must make the change manually in DocuSign. For details, contact DocuSign support. Log into OneLogin as a Super User or Account Owner and go to Apps > Company Apps > DocuSign. 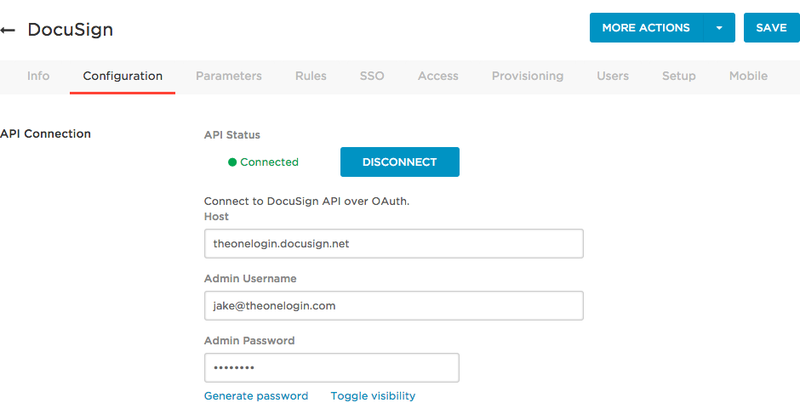 On the Configuration tab, connect to the DocuSign API. Enter your DocuSign host domain in the Host field, and your DocuSign administrator credentials in the Admin Username and Password fields. Click Connect. If the connection is successful, the API Status icon switches to . On the Provisioning tab, select Enable provisioning for DocuSign. Do not select Update user, since the DocuSign API allows federation providers only to add and delete users, not to provision user attribute updates. For any action you select, a OneLogin administrator must go to Users > Provisioning and manually approve each action for provisioning to complete. Clear these options if you want OneLogin to provision new users and user deletions to DocuSign without administrative approval. Select what happens to a user in DocuSign when that user is deleted from OneLogin. To confirm that provisioning from OneLogin to DocuSign is working, add a user to OneLogin and go to Users > Provisioning to approve the provisioning event, if necessary. When the user is marked as Provisioned, go to DocuSign and confirm that the new user has been added.